Students love gifts. But they also want to receive things that are useful for life on campus. As your student prepares to head to college, it’s natural to want to make it a home away from home. Sometimes that means gifts to make his or her life easier or provide a warm memory of home. Let’s face it, who doesn’t like getting gifts? But there’s no sense in spending money or time on things your student will already have or never use. Those T-shirts with the name of your child’s college emblazoned across the chest? Probably already has a closet full. The coffee table book filled with worldly wisdom and advice? Probably never going to open it, plus who has coffee tables in their residence hall room? After talking it over with current college students, we’ve come up with some ideas for things that your student will not only appreciate, but will actually improve their life on campus. When considering gifts for your student, think about how he or she will actually use them, and the impact on quality of life—a board game can be a great bonding tool. Laundry color catchers—Maybe your student is already a pro at doing laundry. Maybe you’ll be getting phone calls asking which machine is the washer and which is the dryer. Either way, anything that makes the process faster and easier will be welcomed by your student. Color catchers mean he or she doesn’t need to waste time separating colors from whites, saving valuable time and making it more likely laundry will get done before clean underwear runs out. College cookbook—A meal plan might cover most of your student’s food needs, but what about the rest of the time? A cookbook that caters to the student lifestyle offers options that are quick to make and utilize the simple tools at hand, like a microwave. It’s a great resource when your student doesn’t feel like leaving the residence hall or needs sustenance outside of regular hours, like to power through an all-nighter (don’t worry, we’re sure that won’t be your student). Bedside Buddy caddy—This useful carrier attaches right to the side of your student’s bed, making it easier to organize important things and keep them within arm’s reach. Sleeping through that 8 a.m. class becomes harder when their phone alarm is just inches from their peacefully slumbering ear. Brita pitcher—Our students all agreed: A Brita is essential. Having one on hand means it’s easy to stay hydrated and your student will always have a purified refreshment available. Disposable utensils—For when your student can’t make it to a dining center. Send along some recyclable or biodegradable silverware, and when your student is done eating there’s no cleanup necessary. Because would you rather your student spend time cleaning spoons and forks or studying for the big exam? Board and card games—Your student can’t spend all of his or her time studying. Board and card games are a great way for your student to take a breather between classwork, are fun regardless of what the weather is like outside, and offer a great way to bond and build relationships with others in the residence hall. Because nothing brings people together like trying to crush a roommate’s army in Risk or bankrupt a friend down the hall in Monopoly. There are many other gifts that your student would appreciate and enjoy, just be sure to consider the ramifications of having any of them on campus. Thinking about getting your student a kitten to keep him or her company away from home? Think again. Be sure you know what items might not be allowed in a residence hall. Each school has its own guidelines, but there are many items that are prohibited by most: candles, grills, toasters, pets, and more. If it could present any kind of hazard, it’s likely not allowed. If the gift of technology is in your plans, be sure to look into what your student’s college offers in terms of student discounts and technological support. Consider waiting to buy that laptop until you’ve talked to the technology experts on your campus. At Illinois State, TechZone is an excellent resource for personalized support (and discounts) when it comes to computers. Also consider waiting on items that would be shared by roommates or impact everyone in the living quarters—scented plug-ins, for example. Encourage your student to shop for those things with roommates, giving everyone a say on the purchase and providing a bonding opportunity. After all, the goal of any truly useful gift should be to help your student adjust to college life and make the most of his or her experience on campus. 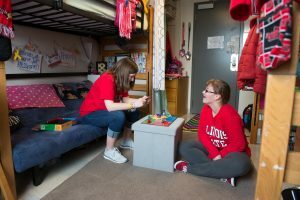 Is your student considering Illinois State for his or her college experience? Encourage them to sign up to hear about opportunities to explore Redbird life. Related Article: Help your talented student make the most of their gifts in college Gifts come in many forms, and just as your student will benefit from what he or she takes from college, the college community will benefit from the talents your student has to offer.